It has been some time since Durban audiences have had the pleasure of seeing a full-blown opera production at the theatre which is named after the art form, the Playhouse Opera. 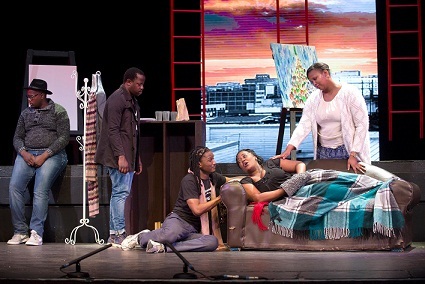 So, the Gauteng Opera Company’s excellent production of La Bohème, under the inspired, creative and very clever direction of Marcus Desando, marked a particularly triumphant return of opera to Durban. Presented by the Playhouse Company as part of its 21st annual South African Woman’s Arts Festival this production of La Bohème is heartwarmingly human, funny, moving, entertaining and most of all featured a cast of remarkable ability. There is a tangible sense of synergy amongst this group, and not only do they create characters that are real and believable, but boy, can they sing. Some of the most impressive opera voices I have heard in a long time. La Bohème was composed by Giacomo Puccini with an Italian libretto by Luigi Illica and Giuseppe Giacosa. Its world premiere performance took place in Turin in 1896. Since then, it has become part of the standard Italian opera repertory and is one of the most frequently performed operas worldwide. The story revolves around four impoverished, but happy, Bohemian friends who live in the Latin Quarter of Paris in the 1830’s. Rodolfo is a poet who falls in love with Mimi, a neighbour in the building where they live, while his room-mate Marcello, a painter, has a stormy relationship with the saucy temptress Musetta. The other friends are the musician Schaunard, and the philosopher Colline. The story is universal and ageless and is about friendship, love, loss and death. Puccini music is marvellously lyrical and magical and features arias such as Rodolfo’s Che gelida manina (What a cold little hand), and Mimi’s Si, mi chiamano Mimi (Yes, they call me Mimi). As Rodolfo, Phenye Modiane displays a beautifully controlled and balanced tenor voice, while Khayakazi Madlala as Mimi is a soprano to be reckoned with. Her voice is gorgeously powerful and velvety. Solly Motaung takes the role of Marcello, and for me was the stand-out singer with a huge, stunning baritone voice. Soprano Siphokazi Maphumulo, who is from Durban, made the most her role as the saucy Musetta. Chuma Sijeqa (baritone) plays Shaunard the musician and Andile Dlamini (bass) from Durban is Colline the Philosopher. Also from Durban is Nicholas Ndadane as Alcindoro, Musetta’s sugar daddy. The KwaZulu-Natal Philharmonic Orchestra, conducted by Lykele Temmingh, performed to their usual high standard and provided an outstanding backing for the singers. The setting of this production was modern-day with the performers wearing contemporary casual clothing. The set was minimalist with a few basic items of furniture and a city-scape backdrop (Johannesburg for two of the scenes). I am not usually a fan of modernising productions but this really worked. Possibly the timeless nature of La Bohème allows for a certain leeway. One innovation which was very much appreciated by the audience was the English translation of the Italian lyrics displayed on a screen above the action. These “sub-titles’ allowed one to follow and understand all the action and enhanced the enjoyment of the production. The audience spontaneously showed their appreciation on several occasions throughout the production and awarded the performers with an extended standing ovation and shouts of appreciation at the end. Durban promoters take note, the full house audience at this performance have shown what they want to see, and hear. Please don’t let us wait as long before we see another quality opera production. There will be one more performance of La Bohème tomorrow (August 12) at 15h00 at the Opera Theatre at the Playhouse. Booking is at Computicket.